"The Affordable Care Act’s health insurance exchanges have proven to be quite sturdy despite a barrage of federal actions that threatened to topple them," Shelby Livingston reports for Modern Healthcare. "The picture of the exchanges that emerges from the CMS’ final open-enrollment data is far from the imploding market that the Trump administration and countless headlines over the past year warned about." Though enrollment decreased and premiums increased by an average of 30 percent this past year, tax credits increased enough for most people that the average person paid less for coverage than the year before. ACA plans remain unaffordable for millions who aren't eligible for financial help, Livingston reports. Congress is unlikely to pass legislation that would decrease premiums before insurers file 2019 plans later this spring. 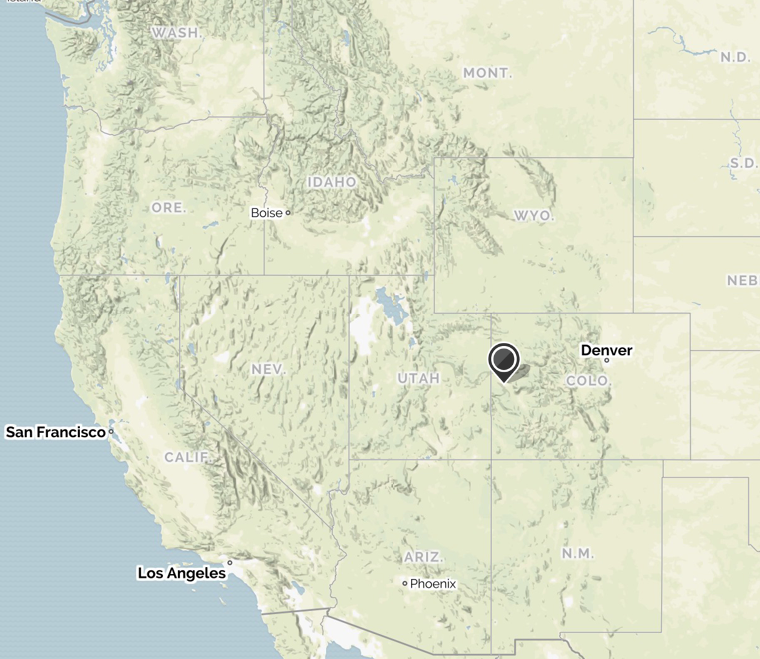 For an Excel spreadsheet showing county-by-county data on Obamacare enrollment, click here. Modern Healthcare map. Click on the image to enlarge it or click here to see the interactive version. President Trump is considering options to help American farmers hurt by the trade war with China, including harnessing the Commodity Credit Corporation and trying to rejoin the Trans-Pacific Partnership, which he abandoned soon after he became president. The CCC is an early New Deal program created in 1933 to help farmers hurt in the Depression. Part of the Department of Agriculture, the CCC can borrow up to $30 billion from the Treasury to deploy in numerous ways, including buying crops to keep prices stable. The White House and USDA wouldn't say how they might use the CCC right now, saying they want to keep their ideas secret to avoid tipping off the Chinese, Damian Paletta reports for The Washington Post. Sen. Pat Roberts (R-Kan.), who chairs the Senate Agriculture Committee, urged caution in using the CCC, saying that he's seen it misused before. "It’s not that I’m diametrically opposed to it to the degree that I’d say no," he told Paletta. "I’m just saying I don’t know how we implement this, I don’t know what kind of cockamamie scheme that we could come up with that would be fair, that would be at least somewhat responsible." Yesterday Trump also floated the idea of rejoining the Trans-Pacific Partnership, though he famously opposed it as a candidate and withdrew the U.S. from the pact in his first week in office. "Trump had told Republican senators earlier in the day that he had asked ... Trade Representative Robert Lighthizer and White House economic adviser Larry Kudlow to re-open negotiations," David Chance and Tetsushi Kajimoto report for Reuters. Trump said the U.S. would only rejoin the pact if more favorable terms were negotiated. Though President Obama championed the TPP since 2008, in 2016 his administration stopped trying to get it passed because of Congressional opposition. Without the U.S.'s input, the other 11 countries went forward with negotiations and eliminated parts on investment, government procurement and intellectual property that were key demands for the U.S.
Rejoining the pact will not be easy. New Zealand Prime Minister Jacinda Ardern told reporters recently that "If the United States, it turns out, do genuinely wish to rejoin, that triggers a whole new process," Chance and Kajimoto report. Australian Prime Minister Malcolm Turnbull said it would be "great" to have the U.S. back in the TPP, but said they're "not counting on it." Federal officials arrested 97 immigrants in rural Bean Station, Tenn., last week in a meatpacking plant raid that the National Immigration Law Center said was the largest in a decade. But it's unlikely to be the last such raid, because of Americans' desire for inexpensive meat and the government's decision to punish undocumented immigrants instead of their employers, Hampton University journalism professor Lynn Waltz writes for The Washington Post. Labor unions once ensured meatpacking workers were well-paid and protected from injury, but in the 1960s meatpackers moved to right-to-work states, erasing those protections. After the 1993 North American Free Trade Agreement, Mexican markets were flooded with cheap, government-subsidized corn from the U.S.; many Mexican corn farmers lost their livelihood and immigrated to the U.S. illegally. Meatpacking plants welcomed them because undocumented immigrants were willing to do more dangerous work for less money than Americans. As president in 2001-09, Republican George W. Bush vowed to crack down on illegal immigration by catching and deporting workers instead of punishing the businesses that hire them, a strategy also favored by President Trump. But surprise raids provide little deterrent for illegal immigration and hurt communities in a cycle that keeps repeating, Waltz argues: "Americans want cheap meat. That requires low wages. So plants hire undocumented workers. ICE raids the plants. Latino families cry. Schoolteachers are put in the untenable position of either supervising children after hours or sending them home, knowing their parents are missing. People are appalled by the human cost, momentarily. Then employers and workers become more sophisticated at evading detection and the cycle begins again." The federally-funded Head Start program helps low-income families across the U.S. with child care, but in rural areas it can be a critical resource for much more. "In 2015-16, 68 percent of rural families with a child enrolled in Head Start received a family service, including job training, parenting education, and substance abuse prevention through the program," Jackie Mader reports for The Hechinger Report, which says it "covers inequality and innovation in education." A new report by the Center for American Progress found that, in some states, Head Start accounts for one-third of all child-care centers. In rural areas, it is sometimes the only available source of child care for families, enabling parents to go back to work or work more hours. That means the program has a big impact on rural economies, too. The program also helps children's health. "Mississippi’s Head Start centers provide each child with five screenings when they enroll, including a vision, hearing and dental screening, to ensure no health issues are standing in the way of learning. Many children in the state’s rural or low-income communities would not get these screenings if not for Head Start," Mader reports. 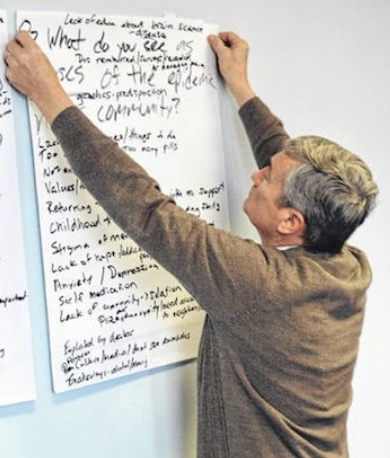 "The centers also work with each parent to create a plan for short and long-term goals and connects families with resources that can help parents meet their goals and services that can help children with any developmental delays that arise." Several areas of the U.S. are facing extreme or exceptional drought conditions this year, threatening crops and increasing chances of another destructive wildfire season. "According to the National Oceanic and Atmospheric Administration’s recently released U.S. 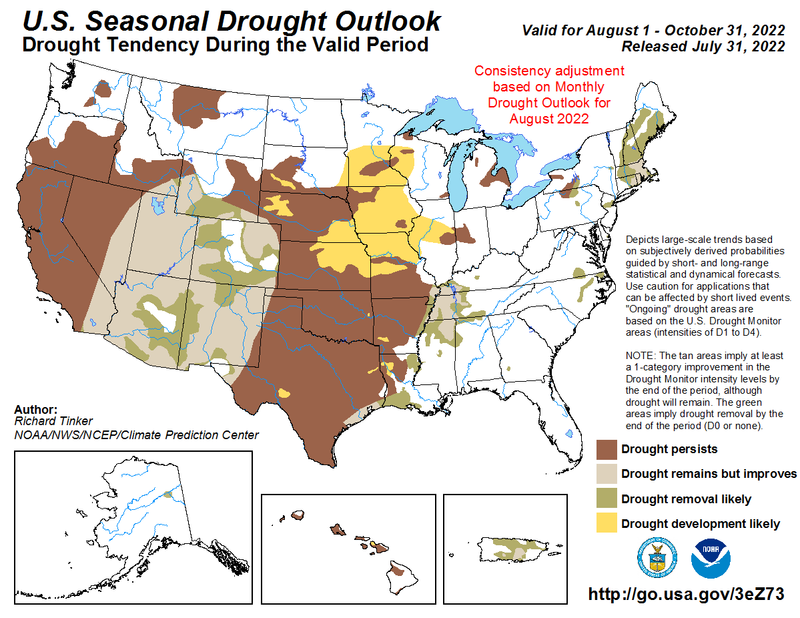 Seasonal Drought Outlook, persisting and additional drought is forecast through June in California, Nevada, Utah and Colorado. The impact is forecast to be especially strong in Arizona and New Mexico, both of which are already almost entirely in the grip of drought," Spencer Chase reports for Agri-Pulse. Michael Crimmins of the University of Arizona's Department of Soil, Water, and Environmental Science told Chase that the weather conditions are drying up rangelands and hurting livestock operations. The Colorado River watershed overall is experiencing one of its driest winters ever, which will hurt downstream farms that depend on irrigation. Paul Gutierrez, a livestock economics expert at New Mexico State University, said farmers will need to use more well water for irrigation if less surface water is available. "It definitely makes the cost of farming go up significantly," Gutierrez told Chase. "The quality isn’t as good either and it impacts the yields of some of your specialty crops." 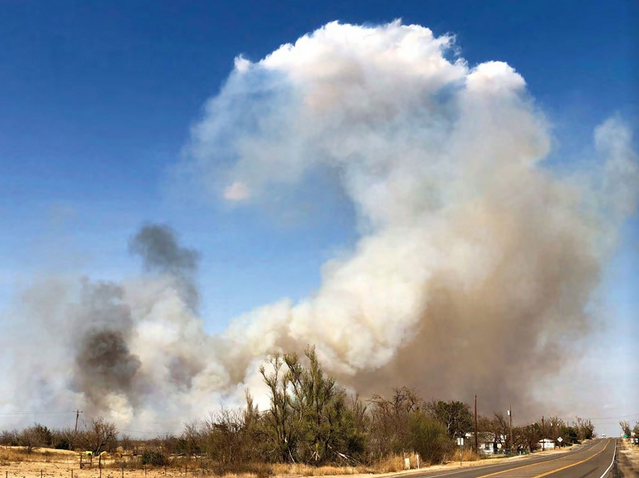 In the Texas Panhandle, where drought conditions have reached the highest level, firefighters have already battled two wind-propelled wildfires in the past weeks, and more could follow soon, Laurie Ezzell Brown reports for The Canadian Record, in a town named for the Canadian River. 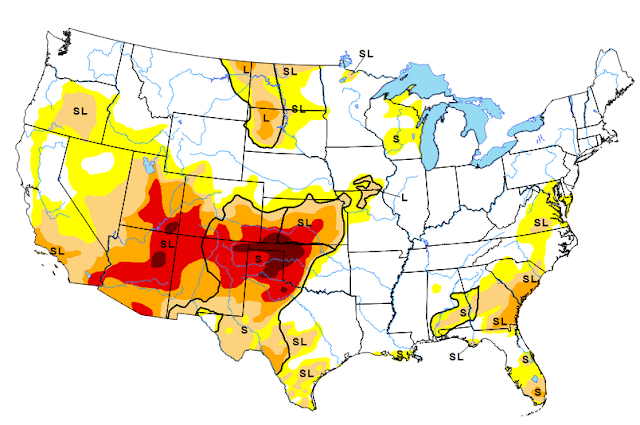 United States Drought Monitor map as of April 5, 2018; click on the image for a larger version. Could trade war hurt West Virginia's energy sector? The escalating trade war with China could hurt not only agriculture, but West Virginia's energy sector. "That’s because the China Energy Investment Corp. signed a non-binding $84 billion 20-year deal with the state to help it develop its petrochemical sector that wants access to abundant and cheap shale gas. It is especially needed in a place that has seen its coal industry lose ground to more competitive and cleaner electric generation fuels," Ken Silverstein writes for Forbes. Steve Roberts, chair of the West Virginia Chamber of Commerce, told Silverstein that the state is on friendly terms with the Chinese, and that "We have to do this in an international environment in which nations huff and puff. We have things that are very valuable to them and we have to go through a process to see if we can do a deal with each other. The relationship is actually improving and that is a good sign." China has its own shale gas reserves--it's the third-largest producer after the U.S. and Canada--and is shifting increasingly to natural gas from coal, but the reserves are in difficult to access areas, so it must import shale gas to meet demand. West Virginia sits on a huge shale gas reservoir, but Silverstein fears the Chinese could choose to delay implementing its deal to put pressure on Trump, or choose other sites to develop such as the Marcellus or Utica Shale basins. China could also buy more liquefied natural gas from Canada, but a larger export terminal would need to be built. Roberts told Silverstein that West Virginia "is trying to make the necessary investments in infrastructure and education that can keep China’s full attention." "The Trump administration will delay any moves to reform the nation's biofuel policy," reports Jarrett Renshaw of Reuters, adding that one of his three sources source said the move was meant to ease concerns of farmers worried about a potential trade war: "There's just a lot going on right now, so they decided to take a pause and revisit in three months." President Trump "failed to broker a deal between Big Oil and Big Corn during meetings over months about the future of the U.S. Renewable Fuel Standard, a law broadly supported in the U.S. heartland that requires oil refiners to add biofuels like ethanol to the nation's gasoline," Renshaw notes. "The biofuel reforms threaten to weaken demand for corn-based ethanol, compounding concerns from farmers about a loss of grain exports to China due to the trade dispute. Rural voters are an important constituency for . . . Trump, helping propel his election victory in 2016, but his support with this group has slipped." The prospect of a deal fell apart Monday, after Trump hosted "the latest meeting on potential RFS reforms," Renshaw reports. "Environmental Protection Agency Administrator Scott Pruitt and Agriculture Secretary Sonny Perdue presented the president with a list of potential options aimed at helping refiners without undercutting ethanol demand. Those options included capping the price of blending credits, called RINs, that refiners must earn or purchase under the RFS while expanding the sales of high-ethanol gasoline blends that are currently banned during summer. The price cap was a non-starter for most of the biofuel industry, a group that includes corn farmers from deep-red states like Iowa and Nebraska, who said it would erode investment in biofuels infrastructure." A cap would have helped "merchant refiners like Valero and PBF Energy," which don't have blending facilities and must purchase RINs," Renshaw notes. "Trump was drawn into the divisive debate over the RFS by the potential shutdown of oil refiner Philadelphia Energy Solutions. PES, which employs a thousand people in politically important Pennsylvania, has blamed its financial woes on the cost of compliance credits under the RFS." Type 2 diabetes is a big cause for concern in rural America, especially in the South and Midwest, according to a study by the Southwest Rural Health Research Center at Texas A&M University. The study, funded by the federal Health Resources and Services Administration, found that despite innovations and increasingly available self-management programs, big differences between rural and urban death rates remain: rural residents are 17 percent more likely to die from a diabetes-related hospitalization than people who live in large metropolitan areas. More than 30 million adults, about 10 percent of the population, have diabetes; 97 percent of them have Type 2 diabetes. It's the seventh most common cause of death in the country, with nearly 80,000 related deaths in 2015. This study focused on diabetes deaths in hospitals in 2009-2014. Of the 38,075 diabetes-related deaths in hospitals, 20.3 percent occurred in rural areas. Death rates were highest in rural areas of the South and Midwest (21.0 and 15.1 per 100,000 population, respectively) compared to the Northeast and West (11.1 and 10.8, respectively). Nationally, a rural-urban difference of 3.4 percentage points amounted to a 17 percent difference in rural and urban rates. The researchers speculated that the difference in death rates could be attributed to factors such as access to primary and endocrinology care, health literacy, trust in the health-care system, access to good nutrition, and lifestyle choices. They recommend that more research be done to explore the role of these factors in mortality discrepancies. In an effort to save endangered loggerhead sea turtles, the Georgia Department of Natural Resources has taken an unusually aggressive approach: a full-time hunters of wild hogs. 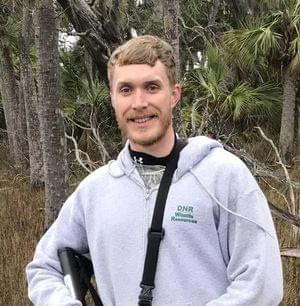 Corey Elrod, 29, whose official title is "hog control technician," lives alone on Ossabaw Island, a 40-square-mile island of wild marshes, forests, swamps and beaches just below Savannah. Feral hogs eat newly laid turtle eggs from May to September, so Elrod's job is to pick off the swine with his AR-15. "I never would’ve imagined that this would be my job. 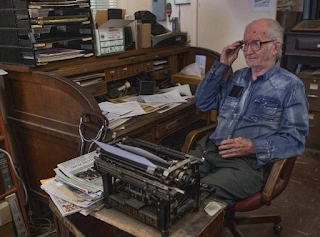 But I sure enjoy doing it," Elrod told Dan Chapman of the U.S. Fish and Wildlife Service, who did a story on it. Chapman reports that Elrod has killed an average of 1,117 hogs per year since he was first hired as an hourly hog hunter in May 2010. The year after that, he was hired full time. He uses dried corn bait, thermal-imaging scopes, two dogs, and traps. Chapman says Elrod is the only full-time government-paid wild board hunter in the South, but most other Southern states have programs dedicated to eliminating most of the hogs. Some states have managed hog hunts, and in Texas, Louisiana and Oklahoma hunters can shoot hogs from helicopters. Texas has a particularly bad hog problem, and has legalized not only hunting from helicopters but hot air balloons (which are quieter than helicopters), and pays hunters for hog carcasses. South Carolina has hired three hog hunters like Elrod, but they're contract workers rather than full-time. Why all the fuss? Hogs are an invasive species thought to have been introduced by Christopher Columbus and other Spanish explorers. They breed rapidly and "compete with native animals — deer, squirrels, ducks and turkeys — for food and devour ground-nesting birds, reptiles and amphibians," Chapman reports. "Their incessant rooting destroys vegetation, creates wallows and furthers erosion." All told, the hogs roam 39 states and cause $1.5 billion in damage to crops and infrastructure each year. The boars also spread diseases like brucellosis and pseudorabies. Elrod's work has yielded good results. Georgia DNR wildlife biologist Kara Day told Chapman that seven years ago, hogs were everywhere on the island. "In the five years before Georgia hired a marksman (Elrod was the third sniper), 31 percent of loggerhead turtle nests were partially destroyed by hogs and other predators. In the last five years, only one of every 10 nests has been partially destroyed," Chapman reports. April is Distracted Driving Awareness Month, so the National Safety Council is offering a free, 45-minute online course about the dangers of distracted driving, available Sunday, April 15 through Saturday, April 21. Distracted driving caused 3,477 deaths nationwide in 2015. A Centers for Disease Control and Prevention study found that people in rural areas are less likely to wear a seat belt and more likely to die in car crashes. For more information or to register for the online course, click here. Even without factoring in distraction, rural drivers face additional dangers on the road: because inebriated people can't call a taxi or Uber in a rural area, they may be tempted to drive home. Fewer traffic lights means more room to speed. Rural drivers have older cars on average that may be prone to mechanical failure. Deer are more likely to jump out in front of drivers in rural areas. And when a crash happens, it can take much longer for an ambulance to arrive and take the victim to the hospital. Common sense dictates that combining any of those factors with distracted driving makes for even greater danger. Non-metropolitan areas got 64 percent of the money in the last round of a competitive grant program that funds transportation projects, the Department of Transportation said in press release. "That’s a reversal from the Obama administration, which in its last year in office provided just $102 million in grants to rural areas. That was just above the 20 percent minimum required by the law that established the program" in 2009, as part of President Obama's economic-recovery bill, Andrew Taylor reports for The Associated Press. 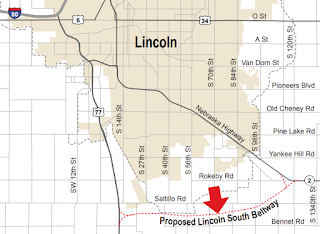 Some of the rural designations on the department's detailed list of Transportation Investment Generating Economic Recovery (TIGER) grants are debatable; for example, a $25 million grant for a southern beltway of Lincoln, Neb., is classified as rural, as is a $25 million boost for a connector road in suburban Loudoun County, Virginia, that opponents call "an outer Beltway" of Washington, D.C. The list says it will provide "safer, more efficient and reliable access to the western, more rural portion of Loudoun County." Nevertheless, the program "is focused more on projects in rural areas that turned out for Donald Trump in the 2016 election," Taylor writes. "That means more road and rail projects in GOP strongholds such as Idaho, North Dakota, and Oklahoma, and fewer 'greenways,' 'complete streets' and bike lanes." While the list said 64 percent of the money was going rural, its definition of rural was broad: anything outside an "urbanized area" as defined by the Census Bureau. That is even broader than the typically broad definition of rural, "non-metropolitan." For example, one of the "rural" grants was $8 million to redo several blocks of a major street in the state capital of Kentucky, Frankfort, population 25,000. A city must have 50,000 people to be the core city of a metropolitan area. The release said a record $39 million was going to projects on Native American reservations; more than half of that is going to rebuild a road in the Lower Brule Sioux reservation in South Dakota. Other than those above, the largest grants listed as rural were $25 million for improvements of a major truck route in Nogales, Ariz.; $17 million for the riverfront in Burlington, Iowa; $16.6 million to finish rebuilding US 212, the Beartooth Highway, in Yellowstone National Park in Wyoming; $16 million to repair the route for Amtrak's Southwest Chief in Kansas and Colorado; $15 million for climbing lanes on Interstate 15 in Utah; and $13.1 million for streets in Immokalee, Fla. The largest urban projects were $20 million for a port in Baltimore; $20 million for a freeway in Rhode Island; $19.9 million for a road-railroad grade separation in Raleigh; $18.3 million for a brudge in North Bergen, N.J.; $$13.25 million for a bridge in a suburb of Charleston, S.C.; $13 million for a port in St. Bernard, La. ; $12.7 million for the port of Mobile; and $12.6 million for a new bus route in Atlanta. In 2013 about two-thirds of TIGER funding went to Democratic districts, which tend to be urban. Trump twice sought to eliminate the program, but Congress tripled its budget to $1.5 billion in last month's spending bill, which he signed. "Of the 41 grants announced by the Trump administration, 25 totaling $271 million were awarded to projects in congressional districts represented by Republicans," Taylor reports. "Districts represented by Democrats garnered 14 projects and $190 million. 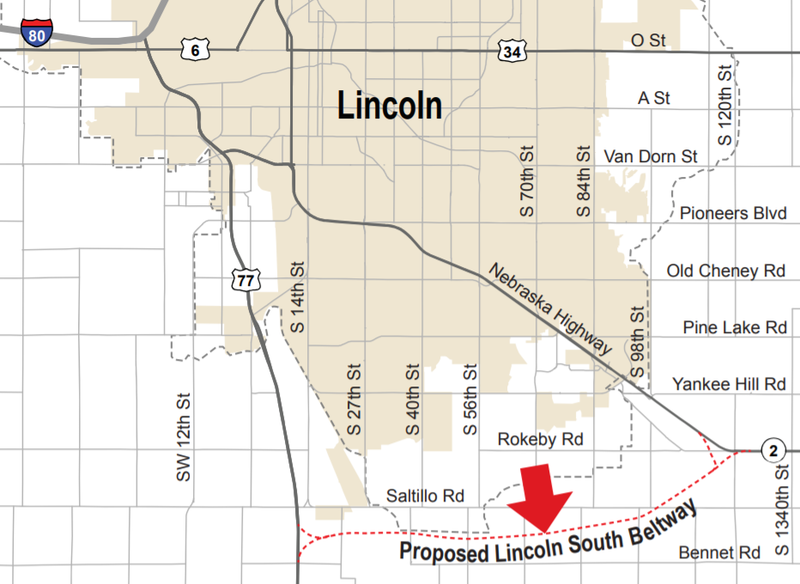 Two grants worth $25 million went to projects spanning district lines." Not counting those two, GOP districts got 64 percent of the grants and 59 percent of the money; Republicans hold 55 percent of the seats in the House. "The Justice Department has decided to allow Bayer AG’s megadeal to acquire Monsanto Co., valued at more than $60 billion, after the companies pledged to sell off additional assets to secure government antitrust approval, according to people familiar with the matter," Brent Kendall and Jacob Bunge of The Wall Street Journal report. "The companies still need some additional approvals, including from regulatory bodies in Canada and Mexico." "An agreement in principle between the companies and the department, brokered in recent days, marked a breakthrough in the U.S. merger review process, which had remained in limbo because of Justice Department concerns about the deal," the Journal reports. "Bayer Chief Executive Werner Baumann and Monsanto CEO Hugh Grant recently met with Justice officials in Washington to help secure an agreement, people familiar with the matter said." Bayer, a pharmaceutical-chemical firm based in Germany, is a major manufacturer of pesticides. Monsanto, based in St. Louis, "is a market leader on seeds and crop genes," the Journal notes. "The deal, which was announced in September 2016, would make Bayer the world’s biggest supplier of pesticides and seeds for farmers. The European Union last month conditionally approved the deal after Bayer agreed to sell off more than $7 billion worth of assets to rival BASF SE . The sales include Bayer’s soybean and cottonseed businesses, as well as Bayer’s glufosinate weedkiller, which competes against Monsanto’s Roundup." Alabama Gov. Kay Ivey, U.S. Rep Mo Brooks and Google and local officials ceremonially break ground on the data center. 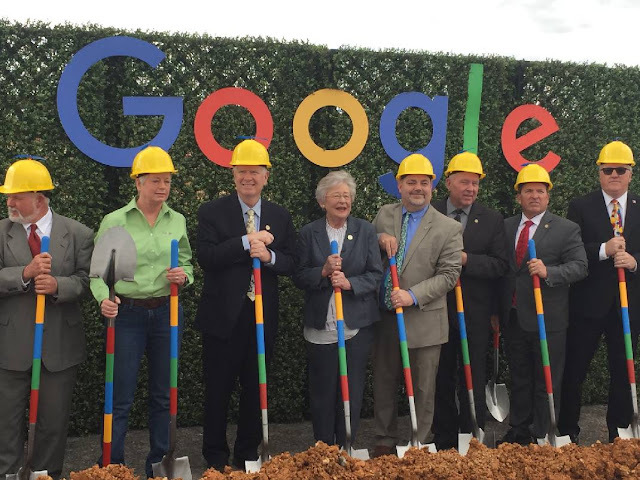 In an apt symbol of rural economic revitalization, Google broke ground on a data center in the northeast Alabama town of Bridgeport (pop. 2,400) on the former site of a Tennessee Valley Authority coal-fired power plant. Google also announced a $100,000 grant to the Jackson County School District for local science, technology, engineering and math programs. "The Google complex, which is expected to employ from 75 to 100 people there once in full operation, was heralded by Alabama officials Monday for turning an economic hardship to a potential economic windfall," Dave Flessner reports for the Chattanooga Times Free Press. 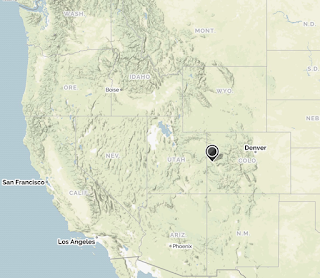 The 360-acre data center, only the eighth in the U.S. and the 14th worldwide, will be built on the 2,000-acre site of the Widows Creek Fossil Plant. The plant, which closed in 2015 after 63 years, brought hundreds of jobs both directly and indirectly in its heyday. Google may buy more of the Widows Creek land, which TVA is still cleaning up. The Bridgeport facility and a similar one on a former TVA site in Clarksville, Tenn., northwest of Nashville, are aimed at helping meet growing demand in the Southeast for internet services such as cloud-based programs, browser searches and video streaming. Widows Creek, on the Tennessee River, was an attractive location because of its plentiful land, water, local labor, and the availability of green energy: Google wants to power the plant with only clean energy, and the TVA promised to provide it with electricity generated with renewable solar, wind or hydroelectric energy. Bridgeport Mayor David Hughes told Flessner that "Having Google in our area will usher in a new era for our community . . . 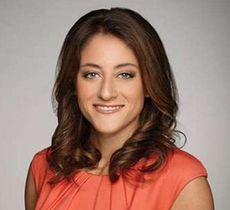 Ultimately, Google will help us recruit other high-tech companies to our area." "Many of the farmers who helped propel Donald Trump to the presidency fear becoming pawns in his escalating trade war with China, which threatens markets for soybeans, corn and other lifeblood crops in the Upper Midwest," David Weigel reports for The Washington Post. That's putting Republican politicians in the difficult position of needing to listen to constituents' concerns while supporting their president and chief of their party. And though "many of the Trump administration’s economic documents have been laughably sketchy and amateurish," Fareed Zakaria of CNN writes in an opinion piece for The Washington Post, Trump is correct on a fundamental point: China is a "trade cheat" and is violating World Trade Organization principles. So Trump and GOP politicos have a tricky line to walk in an election year. "While the battle for control of the House will be waged in large part in the suburbs, rural districts in Southern Illinois, Iowa, Arkansas and Missouri could prove important," Sheryl Stolberg and Ana Swanson report for The New York Times. "And control of the Senate could come down to Republican efforts to unseat Democrats in North Dakota, Indiana, Missouri and Montana — all states staring down the barrels of a trade war’s guns." In a statement last week, Zippy Duvall, president of the American Farm Bureau Federation (arguably the nation's most influential farmers' group), released a statement pleading with President Trump to end the trade war, William Watts reports for MarketWatch. In a visit last week to Kentucky, U.S. Department of Agriculture Secretary Sonny Perdue sought to calm farmers' fears, promising that American farmers won't be "the tip of the spear" in the escalating trade war, Greg Kocher reports for the Lexington Herald-Leader. After years of ignoring horrible living conditions in public housing complexes in small towns on the Mississippi River at the southern tip of Illinois, the U.S. Department of Housing and Urban Development addressed the problem last spring -- but its solution may be just as much a hardship to former housing residences. For years, people who lived in public housing in Cairo and nearby Thebes "were stuck living in aging and neglected buildings with inoperable heat, leaky ceilings, broken windows, mold, mice, roaches, and frequently clogged toilets and sinks," Molly Parker reports for The Southern Illinoisan, in partnership with ProPublica, which recently started an Illinois operation. 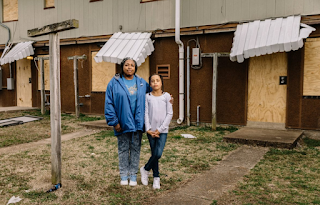 Parker was selected last year for the ProPublica Local Reporting Network to write about issues related to low-income and federally subsidized housing. Federal authorities failed to fix the problems in Cairo for years, in spite of financial reviews and inspections that should have prompted action. In 2017, HUD announced it would close two complexes each in Cairo and Thebes and help the nearly 500 residents, half of whom were children, find new homes. Residents were offered spots in other public housing units or vouchers to subsidize rent on a non-HUD unit, but there aren't enough affordable rental units in the two towns to house everyone. That means some families must move to other towns, where landlords may not want to rent to families with federal Section 8 vouchers. And some residents who were able to find a new home face increased rent and utility costs. Overall, the shuffle has torn apart residents' communities and their social networks and support systems, Parker reports. David Omotoso Stovall, a professor of educational policy studies and African-American studies at the University of Illinois-Chicago, told Parker: "The chances of people ending up in better situations are not great." UPDATE, April 10: HUD says it doesn't have the money to fix up the complexes, but the two senators from Illinois says the decision to close them violates federal law, Parker reports.